to Oklahoma’s teachers, I’ll bring you some raises. it was clear from the start Senator Holt’s 10K plan was not going to fly. As least I’ll build a framework – believe me teachers – you’ll see. the promise of compromise was never to be. so the little legislature just gave up and now seemed to say. when a great big engine called OIL came a whistling down the track. so the Repubs came back with tax tricks and several new fees. add Rainy day and one-time funds and we got this thing. But the teachers shouted out, what about our raises? The little legislature replied, “how ungrateful,” you owe us your praises. quit being greedy and kindly give us your regards. you protected your donors and left us to fend. As hundreds of our best teachers soon leave the state. Spreading their wings and shedding their fears. Sadly I must because of a little legislature that could yet would not. The cliff we’re approaching is of our own making. OKLAHOMA CITY—According to bewildered and contrite legislators, a major budgetary mix-up this week inadvertently provided the state’s public schools with enough funding and resources to properly educate Oklahoma’s children in the upcoming fiscal year. A spokesperson for Senate Pro Temp Mike Schulz’s office reported that as a result of a clerical error, $400 million earmarked for state testing vendors, turnpike repaving, tax breaks for the oil and gas industry, and future income tax cuts for Oklahoma’s millionaires was accidentally appropriated to the Department of Education for the upcoming fiscal year’s education funding formula. To compound matters, $160 million was mistakenly appropriated to provide Oklahoma teachers with an across-the-board $3,000 raise. “That’s the type of irresponsible misspending that I’ve been focused on eliminating for my entire political career,” the representative added. Another embarrassed member of the Republican Platform Caucus angrily acknowledged the $400 million budget slip-up will “unfortunately” help schools statewide retain more qualified teachers as well as supply students with modernized classrooms and instructional materials. Struggling to control his frustration, the representative said he prayed the costly mistake would not result in allowing thousands of Oklahoma’s students to graduate with strong technology and higher order thinking skills. Representative Inman was later seen giggling with colleagues and doing a cart-wheel on the fourth floor rotunda of the Capitol building. Senate Finance Vice-Chair, Josh Brecheen, echoed his fellow legislative leaders and vowed to do “everything in his power” to resolve the costly error that could lead to schools updating their curriculum to emphasize STEM initiatives and 21st century skills by providing students with instruction on how to use newly purchased computers and connect with the world outside of Oklahoma. “Once these kids learn to read and think critically, you can never undo that,” Brecheen said. “In 20 years, we could be looking at a nightmare scenario in which vast segments of our populace are fully prepared to compete in the new global marketplace.” “It could take a whole generation to cancel out the effects of this error,” Brecheen added. Congressional leaders also stressed that providing the state’s students with an adequate education that prepared them for college and 21st-century jobs could also have a devastating impact on the economy by creating a new class of citizens uninterested in working at Wal-Mart or settling for fast food meals. Good evening, Oklahoma. I’m Roger Stone. I am pleased to be joined tonight by education analyst and professor, Dr. Paula Davis, from the University of Oklahoma School of Education. Paula: Thank you, Roger. It’s shaping up to be a great night. This year’s crop of Oklahoma teaching prospects certainly looks strong on paper. Our state’s teaching schools have done a wonderful job preparing these candidates to be able to make an immediate contribution in the classroom. The draft room is really buzzing with anticipation. Roger: You’re right, Paula. While the pool of candidates is down 30% from previous years, the quality of the remaining prospects is excellent. There is some depth at key positions like mathematics and special education. Yet, if previous trends hold true, these teachers will likely come off the board in the early rounds. It is going to be very competitive and I would not be surprised to see a lot of movement between schools. Paula: Absolutely! Draft position has never been more important. I’m confident district human resource directors have been doing their homework and scouted these candidates carefully. I spoke with a group of them earlier and I can tell you they are anxious for a successful draft. It has been a difficult year for teachers in Oklahoma and schools are seeking to fill an unusually high number of teacher resignations and retirements this year. Roger: Well, Paula, it looks like they’re ready to start down on the floor. Let’s go to Mike Sanders at the podium to announce our first pick. Mike: Thanks, Roger and Paula. I have just received a text message from Dr. Deborah Gist, Superintendent of Tulsa Public Schools. 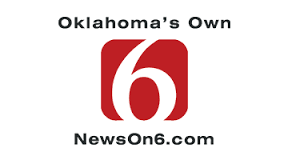 They earned the top pick after winning a coin flip with Oklahoma City Public Schools. Norman Public Schools earned the third pick due to the potential loss of 2016 State Teacher of the Year Shawn Sheehan to a neighboring state next year. Paula: No surprise there, Roger. James has been a coveted recruit for TPS since his earlier days as a student at Booker T. Washington High School. A lifelong Tulsan, Abrams had a 4.4 GPA and was a National Merit Semifinalist at BTW. At NSU, he graduated at the top of his class and is already certified in both intermediate and advanced mathematics. They will likely place James back at his Alma mater to replace retiring calculus teacher, Pam Nichols. He’s a very exciting pick! Roger: James is impressive, Paula. I watched some film of him teaching a Calculus lesson on sine and cosine derivatives as a student teacher. It was mind-blowing stuff! Paula: Wow, that’s a tough break for Tulsa Public Schools. Our sources report that Dr. Gist has already picked up the red emergency phone to Teach For America (TFA) headquarters. It looks like TPS will be looking for another short-term fix to fill its holes for next year. Too bad for them, but you can’t blame James. Ten thousand bucks a year is nothing to sneeze at for a young 22-year-old right out of college. Roger: Ouch! That’s tough to swallow. Let’s go back to Mike on the floor. He appears ready to announce the next pick. Mike: With the second pick in the 2017 Oklahoma Teacher Draft, Dr. Aurora Lora with Oklahoma Public Schools selects (pause) … special education teacher MADISON TURNER, from Oklahoma State University! Paula: Oh, she is a special talent, Roger. I have watched a lot of film on this girl and she can flat-out teach. Not only does she have strong content knowledge, Madison possesses a skill set not typically seen in a young educator. She’s already a master at maintaining student engagement through effective questioning techniques, as well as scaffolding her instruction to make complex topics easier to understand for her students. Roger: You are so right about that, Paula. I observed her at the recent teacher combine. On one set of questions, she registered an incredible wait time of 8.2 seconds, a record for a first-year teacher. The mock students threw every disruptive behavior they had at her and she never once got flustered or upset. She is one cool cucumber! Oh no, not again. 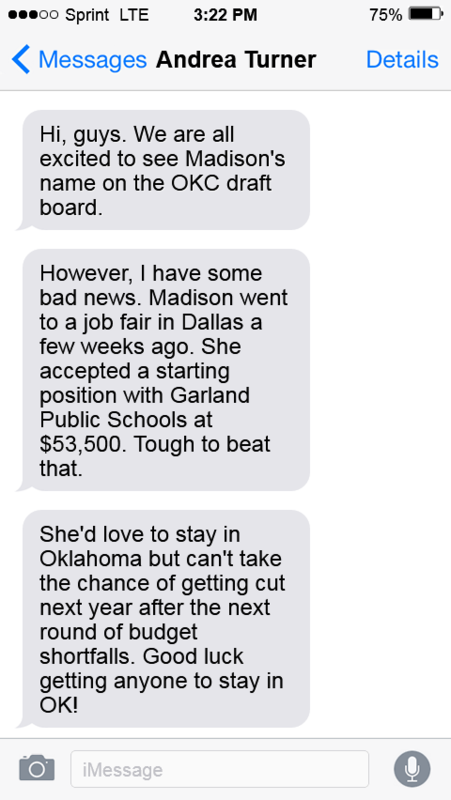 Our producers just received this text message from Madison’s agent, Andrea Turner in Chickasha, who also happens to be Madison’s mom. Roger: That’s a solid punch to the gut of Dr. Lora and her administrative team in Oklahoma City. It looks like they will be filling out a few more emergency teaching certificates to fill their classrooms next year. Bad break for those kiddos with special needs. Mike: With the third pick in the 2017 Oklahoma Teacher Draft, Norman Public Schools selects science teacher JACKSON BLEVINS from the University of Oklahoma (loud applause). Paula: Terrific selection, Roger. Jackson is the top science teacher in this year’s draft. He is highly versatile and can teach multiple high school subjects, from Biology to Chemistry and AP Physics. He also interned at Norman North High School this spring so he is familiar with the system. With a good summer of professional development, Jackson will be able to contribute on day one. Roger: With the current shortage of science teachers, Norman really needed this pick, Paula. Blevins has all the intangibles: positive rapport with students, high enthusiasm, the ability to scramble his lessons on the move, and an innate feel for the game. 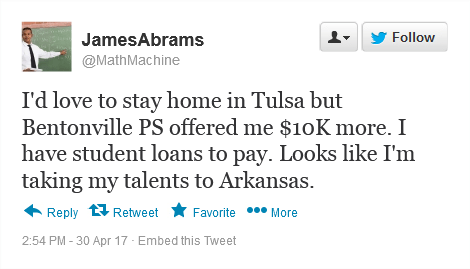 I have also heard he loves the Norman area and is unlikely to move. Mike: Roger, you might want to check your feed. Apparently, a Facebook friend of Jackson just reported he has pulled his name from the draft pool. 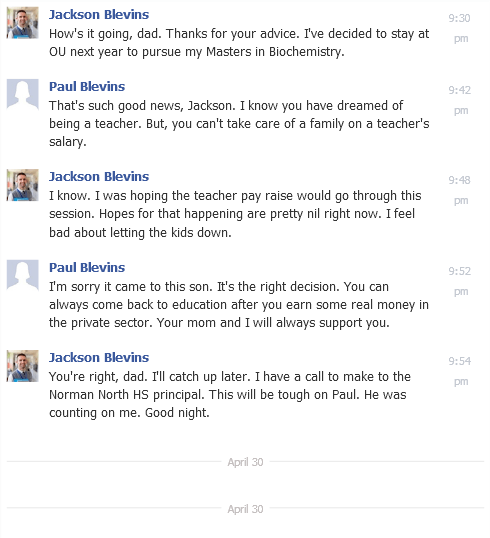 The friend forwarded this conversation between Jackson and his dad from last night. Roger: Incredible! Things sure happen quick with today’s social media. Paula: I am blown away, guys. It is starting to look a lot like last year when so many of Oklahoma’s most promising young teachers took their game to surrounding states or chose other careers altogether. School administrators across the state will be scrambling once again to place high quality educators in their classrooms before the start of the 2017-2018 season. Roger: No doubt about that, Paula. Until state leaders do something substantial to address the budget problems in Oklahoma, we can expect to see a lot more of this in the next few years. And, you know who the real losers in this scenario are, right? Paula: I do, Roger. It’s the kids, along with the future prosperity of our state. Roger: Yup. It will be tough to build the team back up. But if there’s anything I know about the teachers of Oklahoma, they will do everything in their power to protect kids and make it work one more year. I just hope they can keep it up. Maybe we’ll pick up some good talent in the later rounds. We have all become accustomed to politicians making bold claims and promises or using hyperbole and artful “fact selection” to bolster their image or reputation. While there have been many politicians over the years who were gifted in the art of self-aggrandizing, our current President is arguably one of the best of all time. To channel another Carly Simon song, he’s so vain he probably thinks this blog is about him. Well, okay, I suppose he’d be partly right in this case. Anyhow, I think if you were to ask President Trump, he would proudly trumpet (pun intended) that in nearly every important area: nobody knows more or does anything better than him. The president forgot to mention that nobody is quite as humble as he is, either. While I choose not to waste valuable time dissecting the president’s list of self-proclaimed expertise, I do wonder if there might just be even one person still alive who survived the bombing of Hiroshima or the Fukushima or Chernobyl disasters and could understand the “horrors of nuclear” more than our president. I’m just writing out loud. In all seriousness, this isn’t meant to be an exercise in Trump-bashing. Instead, I am using the president’s example to generalize about the proclivity of some people in positions of power to anoint themselves as experts or masters of special knowledge or skills when they really aren’t. A commander-in-chief who never served a day in a combat zone or watched a fellow soldier die yet profess to be the top expert on the military is a dangerous man. But I digress. We have certainly seen this scenario play out in America over the past twenty years in the area of education reform. We have billionaires influencing education policy who never taught in or even attended a public school. We have policy makers who will accept the opinion of a conservative “think tank” without hesitation, while hastily dismissing the viewpoint of real educators in the field, calling us lazy and self-serving. We have test vendors and profiteers driving the development of curriculum more than the actual teachers delivering it to children. We have state leaders “taking over” local districts to run their schools instead of trusting (and resourcing) local school boards, citizens, and educators to make the needed improvements. We have politicians who view standardized tests as a more accurate tool for measuring student achievement than the judgment of a teacher who spends 180 days with the child. As a result, we now have teachers and schools jumping through hoops seemingly every year due to increased state and federal mandates, ever-changing academic standards, updated student assessments, changing evaluation models, new curricular programming, rapidly evolving technology expectations, and new yet unimproved professional development, all while facing more and more scrutiny on how they manage student behavior in their classroom. And some wonder why we have a teacher shortage in America. Nobody understands education as well as the teachers and school administrators who work with kids every day. The fact that anyone would try to dispute this point illustrates how far offline we have moved as a nation. If you had a question about your health, would you ask your physician or call your state legislator? If you needed to develop a trust account for your aging parents, would you consult a tax attorney or email Bill Gates? If you were building a new home, would you get better advice from an architect or the creator of Legos? If you needed a car repair, would you solicit the opinion of a trained mechanic or the owner of the automobile dealership where the mechanic works? It’s simple. The people closest to the action typically have a better understanding of the strengths and challenges of the organization. They’re also in the best position to actually fix things. Don’t mistake my intent. I am not claiming that educators are perfect and without fault. There are many aspects of education in America that bear additional scrutiny and we, as professionals, must do a better job of policing our own and counseling teachers towards professional growth … or, failing that, towards the door to another occupation. That said, the majority of our teachers are hard-working, motivated, conscientious, caring, and highly skilled practitioners. They should have a voice in the discussion about education reform because what they have to say is valuable. Nobody knows better than teachers the importance of education in improving children’s lives. Nobody knows better than teachers that children do not learn at the same pace and that effective teaching involves meeting the unique learning needs of each child. Nobody understands better than teachers the real impact of hunger, poverty, neglect and abuse on the learning capacity of a child. Nobody knows better than teachers how larger class sizes and fewer resources severely limit their ability to do their jobs. Nobody knows better than teachers the sense of hopelessness one experiences while watching a student struggle when they are truly giving their best. Nobody knows better than teachers which assessments are most effective in determining what a child knows and is able to do. Nobody understands better than a teacher the passion and drive it takes to enable EVERY child in their classroom to succeed. Nobody knows better than a teacher the negative effects that overemphasis on testing has had on our students and schools. Nobody but the teacher cares more about the well-being of ALL kids in his or her class. Nobody knows better than the teacher the importance of love, kindness, compassion, and resilience in the lives of kids. Just imagine if education reform was pushed from the bottom up instead of the current, top-down model. We certainly couldn’t do worse than the “experts” in charge now. Nobody does it better, teachers. Baby, you’re the best! Believe me. Lots of really terrific people say so.